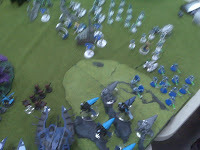 Once again, the Eldar and Tau forces clashed. This match-up was getting pretty stale around here until this game. 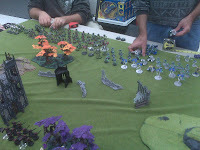 My brother and I only have one army apiece, so battles are always Eldar vs. Tau. However, new lists, a higher point total, and a nonstandard mission (courtesy of DLT's Alternate 40K Missions) breathed new life into the battle. The squad of broadsides immobilizes my dire avenger-carrying wave serpent, which effectively wrecks it because nothing ever gets in range of my shuriken cannons for the remainder of the game. One hammerhead manages to stun my falcon. The other hammerhead misses. Things look dire for the Eldar... one transport that won't be transporting anything and one tank that can't shoot or move... not a good sign. A unit of crisis suits and the vespids come in via deep strike. Both arrive out in the open, which I initially think is a mistake until I realize that I really don't have anything that can hit them there except for the fire prisms. The falcon explodes from broadside bombardment, and between the explosion and subsequent fire I lose all but one dire avenger, who breaks and runs for my table edge. He does manage to shoot and kill a pair of vespids on his way off of the board though. The wave serpent that can still move (the one carrying fire dragons) gets hit by a hammerhead but is only shaken, so it moves to drop fire dragons to blow up said hammerhead. Unfortunately, the hammerhead in question explodes and kills a fire dragon in return. The seer council wipes out the unit of crisis suits it assaulted the previous turn. The other set of crisis suits deepstrikes onto the board. This group throws flamers at the guardians inside the caves, which kills all but two, and they immediately run off of the table. The Tau commander almost annihilates the remaining fire dragons but leaves one brave soul still standing. The broadsides destroy the remaining wave serpent, so the remaining fire dragon has no hope of scooting across the board and popping the other hammerhead. Lots of guys shoot at the seer council, but fortune saves the day and no models are removed (the farseer suffered two wounds). The seer council burns away a unit of fire warriors and moves to avoid getting assaulted by the opposing HQ. The fire dragon attacks the Tau commander but fails to slow him down. Fire prisms combine beams to deal some damage to the crisis suits in mid-field. The Tau commander moves, runs, and assaults the seer council. He does no damage but prevents them from decimating the last group of fire warriors on the board. Broadsides destroy one of the fire prisms. The other prism manages to put a few wounds on a squad of crisis suits. These are pretty uneventful. 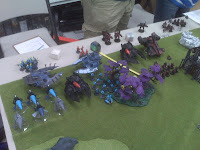 At this point, we realize that the Eldar cannot win. The best they can hope for is a tactical draw, and even this depends on the HQ vs HQ assault ending so that the council can turbo boost and contest the table quarter claimed by the fire warriors. 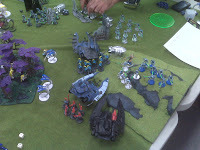 Due to the clash of tough-to-kill units, the game ends with the two HQs still locked in close combat and the small group of fire warriors easily claiming their objective. 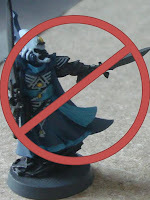 And thus, my not-losing streak with the Eldar has come to an end. I've found myself stuck in tactical draws, but until this battle I had not actually lost. All in all, I did enjoy the game. The new mission and deployment options were fun and a great break from the norm. 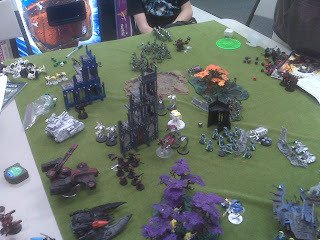 I just hope I can get the Eldar back onto that not-losing streak that I was on previously. Well, I've been at it for over a year now and just broke the two hundred post mark. In the past year (and part of 2008), this humble little blog has evolved from a way to burn time while bored... to a way to gather and record my experiences as a gamer and hobbyist... to a fairly time consuming (but enjoyable) hobby in and of itself. To say the least, I've enjoyed the experience and plan to continue as long as the mental exercise amuses me and my readers stay entertained. I want to take the time to thank my readers, whether you've found me through the Bell of Lost Souls Alliance, the From the Warp Bloggers Group, the RPG Bloggers Network, or just by chance through a random link or search. I've genuinely appreciated the feedback, advice, and encouragement you've all freely given. 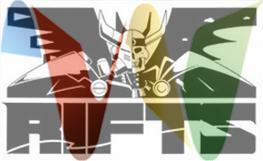 We'll be starting an online Rifts campaign soon (using Google Wave! ), but some of my players aren't all that familiar with the system. 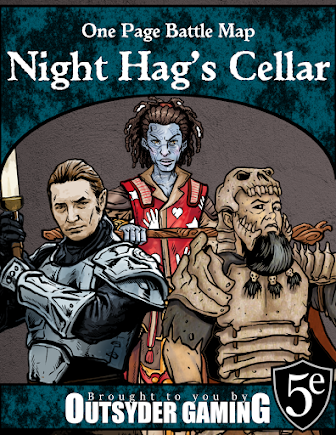 This post is to help my players choose what types of characters they'll want to play. Crazy - augmented warriors who trade their sanity for superhuman strength, speed, reflexes, endurance, etc. As we get further into the campaign preparation, more options will likely be added. As of right now, I want to remain as generic as possible. In all honesty, I haven't messed with my Spectrum Shock campaign in months. However, while digging through some old folders on the laptop this week, I stumbled upon a few NPC spotlights that were almost finished, so I finished them up. All of these were exercises in mixing and matching different D20 resources to come up with interesting characters for a post-apocalyptic campaign. This particular NPC, Myrna, uses material from D20 Modern, D&D 3.5, and a supplement from RPGObjects called Supers20. At times one of Aron Illarion's travelling companions, Myrna is on the run from the DC military for entirely different reasons. She worked for DC emergency services for years before discovering that she had superhuman abilities. While on a seek and rescue mission, she found herself unable to reach her target... but after visualizing herself by his side, she found herself actually by his side without moving an inch... she had teleported! She immediately assumed that she had awakened some sort of latent psionic ability within herself, but testing proved her theory false. In fact, testing couldn't pinpoint the origin of her ability at all. Unable to define the source of the power, DC scientists began making subtle accusations that she might have been tainted by the supernatural. Myrna knew the eventual results of that line of thinking, so she gathered what she could carry and left as quietly as possible. Of course, the DC officials interpreted her fleeing as an admission of guilt, and added her to their list of wanted criminals. Myrna now drifts around the wilderness, searching for someone knowledgeable enough to explain how she ended up with her special talent. In the meantime, she is immensely enjoying both the opportunity to see the world and the ability to pop up wherever she pleases. Still, a nagging feeling of uncertainty plagues her thoughts... what if the scientists were right? What if she has been corrupted somehow? Possessions (Wealth +4): In addition to her combat gear, Myrna carries a full backpack with her that is full of knickknacks and random items that she thinks she might need. Although she struggles to carry it long distances in the conventional fashion, she generally doesn't travel very far conventionally. She has far too much fun traveling by "hopping" short distances with her teleport ability.